240* "The Man who was Afraid"
245* "The Kid Glove Killer"
dramatization of a mystery story in which a man finds himself betrayed. 249* "The Message in Red"
Three women are murdered on the same night with the same gun. "The Message in Red" was followed by a Mr. and Mrs. North episode where Ellery Queen helped to solve "The Murder in Mink"
252* "The Doodle of Mr.O'Drew"
Repeated 05-13-48 as "Nikki Porter, Starlet"
253* "The Peddler of Death"
254* "The Man with Two Faces"
256* "The Man Who Loved Murders"
most far-fetched imaginable. An elaborate and very clever sales presentation. saying "Well I'll be god damned." 258* "The Various Deaths of Mr. Frayne"
An international jewel thief baffles the police of two continents. crime in competition with Scotland Yard and New York's finest. A female fencer from France was stabbed to death with a foil. victim, but fails to identify either. 267* "The Clue of the Elephant"
268* "The Man Who Waited"
The Armchair detective is murdered whilst Ellery Queen is on the air. Ellery finds the solution before the show ends. Repeat performance guest: six of the "Goldwyn girls"
271* "The Girl who couldn't get Married"
272* "Nikki Porter, Murder Victim"
Guest Armchair Detective: six of the "Goldwyn girls"
273* "The Man Who Bought One Grape"
Blaze" This fact is essential to the solution hence the choice of guests. glass eye. Then the thief is murdered. 275* "The Nine Mile Clue"
276* "The Crime in the Darkness"
Ellery investigates a case where a man uses telepathy in stead of his eyes. 277* "The Hollywood Murder Case"
crime. Then soundtrack is stolen and the second director murdered. becomes prime suspect when that racketeer is murdered. 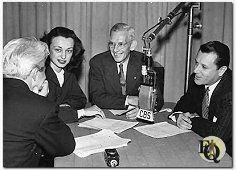 Trudy Warner was first married in June 1946, prompting a voluntary suspension of her Radio career and her departure from the successful Ellery Queen Mystery program. Nikki was written out of the script until the middle of July when Charlotte Keane took over. 280* "The Great Spy Puzzle"
281* "Cokey and the Pizza"
282* "The Double Die" aka "The Devil Die"
A butler blackmails three of his former employers and gets murdered. A tea-brewing clue helps Ellery out. hand of a Venus statue facing the door. Three young college students are the focal point of attempted murder. 287* "The Man Who Got Away with Murder"
A lawyer phones in and confesses to a series of recent murders. To get the better of Ellery he then claims the caller was an impostor. The lawyer is stabbed to death. 289* "Bis to Cal" aka "Bis and Cal"
daughter's thumbprint in blood. But is she really kidnapped? A young woman gets blamed for the murder of a patriarch. Copyright � MCMXCIX-MMXIX Ellery Queen, a website on deduction. All rights reserved.